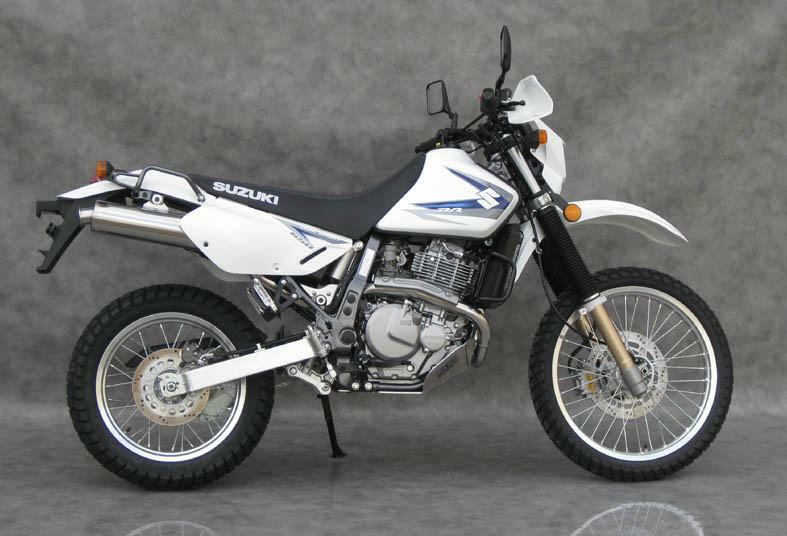 The Suzuki DR650S fits into that grey area between Dual Sport bike and Adventure bike. It’s not as comfortable off-road as a lot of lighter Dual Sport or Enduro bikes due to its weight, yet its a lot better choice on single track trails than a lot of the larger adventure machines. The small fuel tank is really the only thing stopping it from being called an entry-level adventure bike. The bike can be modified in either direction to suit road or trail simply by changing the tires and adding a larger fuel tank and maybe some wind protection. Shorter riders will welcome the ability to lower the seat. Suzuki has an accessories kit to lower the seat 40mm/1.6 inches. The DR650 is one of Suzuki’s longest-running models, with a design dating back to the early nineties that is almost old enough for it to be classified as a retro bike. It remains unchanged for 2018. The first models, the Djebel/Dakar and the RS were introduced in 1990, with the first electric start model the DR650RSE released in 1991. In 1996 the DR650SE was introduced. The engine was radically redesigned, and the bikes weight reduced by 25kg/55 lb. The bike’s styling was updated with Suzuki’s yellow off-road racing colors in 2002. From 2010 the SE model had the factory option of lowering the seat height by about 40mm/1.6 for shorter riders. By 2015 the DR650SE became the DR650S and had been in production over 20 years. The basic design still remained unchanged. In New Zealand, it is the best selling bike over 500cc and is often in the top 5 sellers of any capacity bike. It is also a big seller in Australia and Canada, though not commonly sold in Europe due to Stringent Euro 3 emission regulations which make it hard for non fuel-injected bikes to pass. 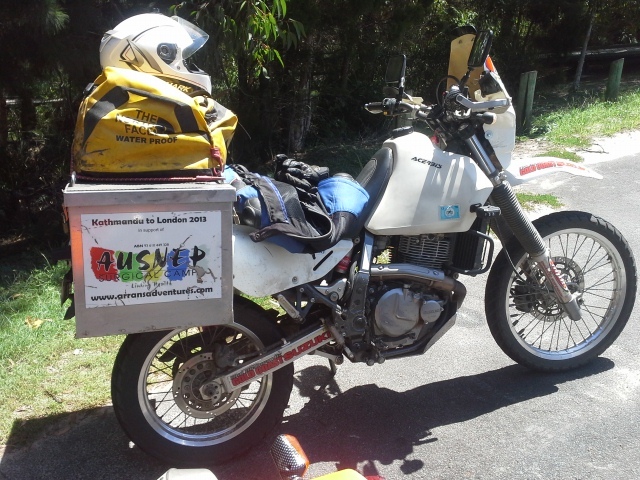 Eligible for Learner Approved Motorcycle Scheme (LAMS) in Australia. 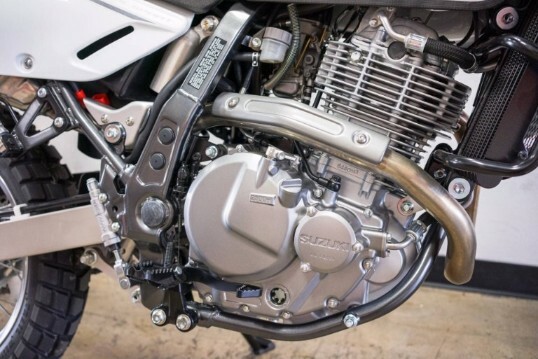 The air-cooled single cylinder motor and Mikuni carburetor may put off some riders, but the simplicity of it appeals to others. The bike has no electronics compared to a larger adventure bike. Its simplicity makes it easy to work on, but you don’t get all the high tech gadgetry normally associated with adventure bikes. The air-cooled 644cc engine means there is no radiator, water pump, thermostat, plumbing and fan to complicate things, and no Ride-By-Wire or Traction Control to fail you and leave you stranded in the forest. This reduces the weight considerably. There is only an external oil cooler (SACS) on the right-hand side to reduce engine heat. It has plenty of torque for off-road hill climbs and cruising at highway speeds for long stretches, without over-revving. At 366 pounds (166 kg) it weighs in at the bottom of the range for adventure bikes. The frame is a single-downtube, double cradle tubular steel frame under the engine, which doesn’t come standard with a bashplate, so this is a definite add-on for off-road use to protect your engine. 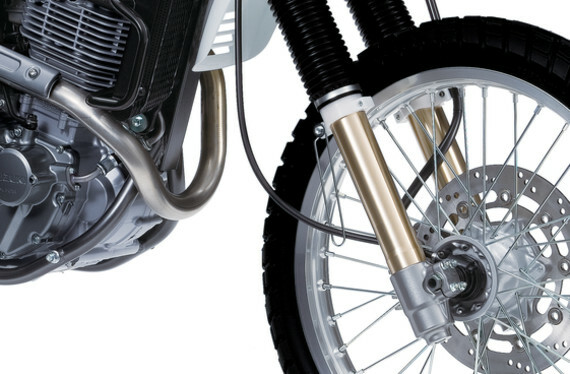 Suspension travel is 10.2 inches front and rear, which is definitely a bonus for off-road riding. The rear shock is fully adjustable for spring preload, compression, and rebound damping. Accessing the threaded spring collar to adjust your rear preload is quite difficult, so there’s room for improvement there. The unsprung weight is kept to a minimum with the use of hollow axles and lightweight brake discs, which help reduce the amount of work the shocks have to do to keep the wheels on the ground. The 21″ front wheel is a must for off-road riding, and the rims are aluminum tube type, with stainless steel spokes. The standard tires work well enough on the road and moderate off-road conditions, but if you intend to do a lot more off-road than on-road, some road legal knobbies would help. The instrument panel is minimal, which is ideal for off-road conditions, especially when you drop the bike. 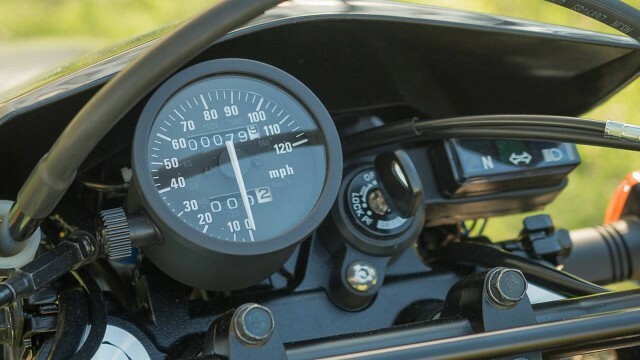 There is only an analog speedometer with a single tripmeter, and some warning lights. There is no tachometer, fuel gauge or anything else usually associated with larger adventure bikes. The standard mirrors are large and will break the first time you encounter a tree or fall. Some smaller, lighter aftermarket mirrors would help. The standard DR650S is something of a blank slate. Modify it to suit your riding style, whether that’s a weekend trail bike, a means of transport, or serious adventure bike. The only real gripes with the bike are small fuel tank and narrow, hard seat. Fortunately, both can be taken care of with aftermarket parts. Even if you have to add some accessories, it is still an inexpensive bike. Add Handguards. Some Barkbusters with an alloy backbone would be the first thing to add to save your fingers and the levers. Handlebars. Replace the steel one with a lighter, stronger alloy handlebar with more rise, so that you have a more comfortable riding position standing up. Rear End reduction. The taillight and rear guard are very bulky, so a more compact aftermarket taillight/blinkers/rego plate hanger would be essential. Save the original and refit it for resale. Tires. Replacing the tires with some good quality knobbies would make a big difference in the dirt. Also, some heavy duty tubes to reduce the chance of punctures. Bashplate. A decent alloy bashplate is essential to protect the engine cases and frame from rock damage. Mirrors. Some lighter after-market mirrors as the stock DR mirrors are quite bulky. Larger Tank. An aftermarket mid-capacity tank would make the DR650 a great adventure bike if you are planning longer multi-day rides. The basic design of the Suzuki DR650S has remained unchanged for over two decades, which can be a good thing. There are definite advantages in a simple sturdy reliable design, especially in remote areas where good quality fuel is hard to come by, and you find yourself having to make trailside repairs. 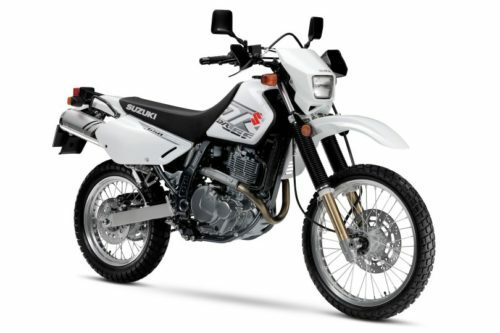 The DR650 and DR-Z400 are often the bikes of choice by Motorcycle Aventure Tour operators, and for good reason. This bulletproof bike has a gained huge following of loyal riders since its introduction over twenty years ago. But don’t take my word for it. Just ask any of the legions of riders out there who absolutely love this motorcycle. Have you owned a DR650? How have you used it, weekend trail riding or adventure riding? Please feel free to share your thoughts below? If you’re planning on carrying a load, a rear suspension upgrade is also a popular mod. Better lights are also popular. It’s an ideal foundation for building exactly what you want. I love my DR! Hi Arran, thanks for your comments. Yes the DR is perfect for modifying to suit the type of riding you’ll be doing, whether it’s adventure riding or weekend trail riding. The simplicity of it is great for trouble-free riding.